So let’s pretend that maybe you want an iPad or a bigger screen iPhone, but you don’t want to pay pay for one. Hmmm, but you already have an iPhone? Well then, have we got a solution for you! 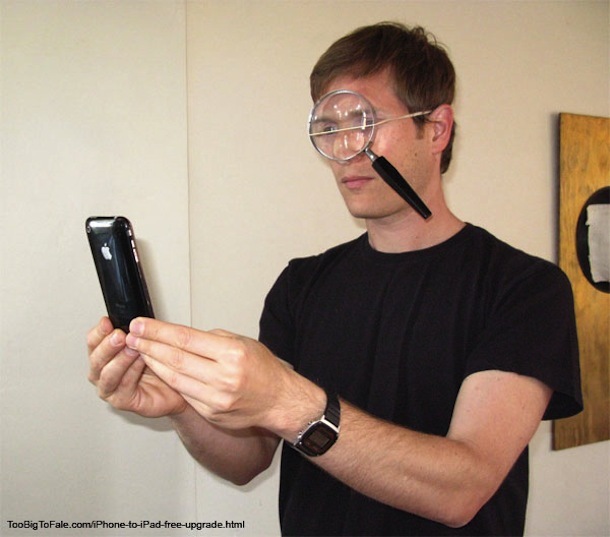 That’s right, with this amazing iPhone to iPad upgrade kit, you just strap a giant magnifying glass to your face with a comfy rubber band, and that iPhone is transformed into a big screen beauty! Be the envy of your friends and colleagues in just moments. Ok, this is clearly a joke (and kind of a bad one, but it got a lot of laughs anyway) but the idea is amusing enough. So. Stupid. Thank you Jeff for sending in the hilarious picture! Oh and by the way, if you happen to try this out by strapping a magnifying glass to your face, do send us a picture to join this one! Honestly I can’t look at my original iPod Touch the same way again after getting the iPad yesterday. In comparison the iPad is so much bigger and way better than my iPod Touch. What’s ironic is that I paid the same price for my iPod Touch 1st as I did for the iPad yesterday. However, I did do at least 4 firmware updates in the last 4 years I’ve had the device. So I spent 40 bucks more on my iPod Touch than my iPad. That’s not including the costs of music downloads, and apps installed. And yes both device are 16GB versions I bought. I had originally had plans to get the iPad on the 29th but they sold out, and magically got more in stock within 3 hours so I came back the next day to pick it up. Funny idea, I just adapted it to enlarge my 24″ iMac screen. Boy it’s really huge now.